Maury Carter, born in Ferrum, Virginia. My dad was a farmer and a carpenter. We had a small farm, 100 acre farm in Virginia not far from Roanoke. And I grew up on a farm with cows and horses and chickens and all that kind of stuff…. Maury L. Carter photographed in his Orlando office, Florida Trend, July 1991. Yeah, my great grand daddy was killed in the Civil War. He was fighting for the right side, you know. And when they came in they took his farm and the cows and all that stuff so he decided to fight and he was killed. Well, he got wounded and he died from his injuries during the Civil War. But anyway, that’s all the history that I know about. [So they took his property?] Well, not his property. When they came through, he knew they were coming – he’d gone to fight the war- and they came through and they took – they explained it as they took it. They took cows, horses for the troops, cows for the food, and the wheat and the grain, and what have you, and his moonshine. Of course, they needed that. That’s when they went through. They couldn’t go to Publix. They took food from the land as they went through. I knew my grandfather. He’s the one who told me all about that. I was about 12 or 13 years old and he died when he was 93. He actually explained to me what happened. He was there. Anyway, that’s history I don’t usually talk about, but since you asked. What was his name? Joshua Carter. Well, my dad was primitive Baptist. But there were six of us. And if you’re familiar with Primitive Baptist, aren’t so Baptist. And so for him it was Saturday and Sunday was the time for church. You work all week, you know. But so long as I got my chores done – the horses, the chickens, the cows and what have you by – got my work done by midday Saturday, I was off until Monday. And so, but I didn’t go to church. I shouldn’t admit that. But he never insisted. All my friends their dads were sort of religious. They worked all that, and then they go to church and then they had Sunday afternoon off. I had the weekend off as long as my chores were done. But, it’s very interesting. 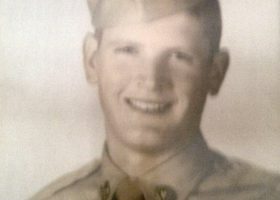 Except during World War II, I had three brothers in the war and that was a miserable time then because Bedford County lost 19 people in less than one hour. And so, that put a fright in all – brothers, two of them over there, you know. But they come home. Do you know what they did in World War II? I worked with engineers. I worked with some of the brightest engineers in the world. But I was on the business management side. We were involved in all the coordination, the scheduling. You know it’s interesting on the engineering part, and the engineers get the credit they deserve. They well deserve credit. I mean they design it. You know what happens after that? Other people build it. You know, we had, of course, the facilities people. You had people like Cliff Kelly there at Martin way back. Cliff Kelly was the procurement person. You know he had to order the parts. You know a missile has thousands and thousands of pieces and parts; a lot of them are made there and a lot of them ordered. And he was in charge of ordering all that in. 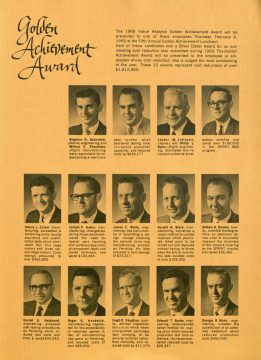 The 1968 Value Analysis Golden Achievement Award for Martin employees whose cost reduction idea is judged the most outstanding for the year. We had manufacturing people. Charley Blaney in charge of manufacturing. They built it. And then you had all the inspections. You know, your missile, there’s a lot of pieces and parts in there. In the design of the missile you have a head engineer like the people mentioned, but you also have engineers that design for each piece and each part. But my job, by the time I left there I was in program planning or master planning. And we planned the schedule, the monitoring, the status, the liaison. If we had problems with the vendor we would go and find out what’s wrong here and that type thing. So, I was on the management side rather than the engineering side. Maury L. Carter, Martin Marietta Corporation 1968 Golden Achievement Award employee recognition photo. I studied mostly accounting. The usual things they throw at you. Things I didn’t want. I had to dissect a grasshopper. Now why I had to do that- I’m mad at them for making me do that. But, you know, that the real thing about it is, I went to Martin after I got out of the Army – on the job training. College- I did finally get the degree. 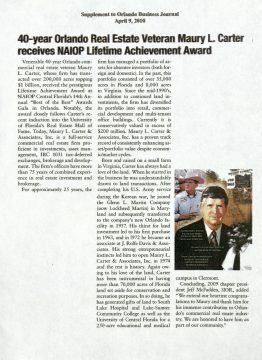 When I was at Martin, well, backing up, when I finished Ferrum College and was drafted in the Army, when I got out of the Army, had planned on going to the University of Virginia to finish my career. There was a temporary job for me [at Glenn L. Martin] when I went there. I went to work in October after I got out of the Army…. 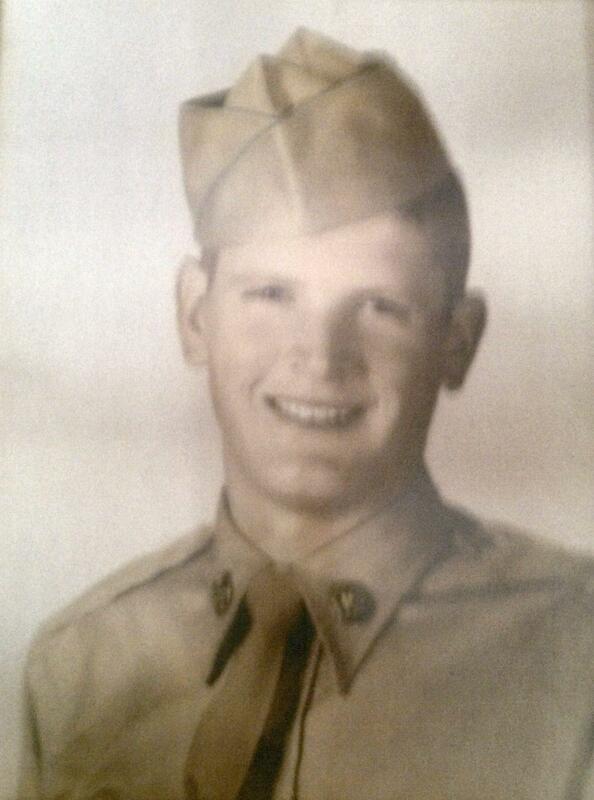 Maury L. Carter, United States Army Specialist Third Class, age 21. But they treated me so well, I decided to stay there. I got some raises at that time, you know, and they treated me very well. And they wanted me to stay. I had to make a decision. Do I leave here and go to college? But the payment and the rate they were paying me by then. I said, if I got out of here and went to college I probably couldn’t get a job any better than what I had right there already so I stayed and went to night school. 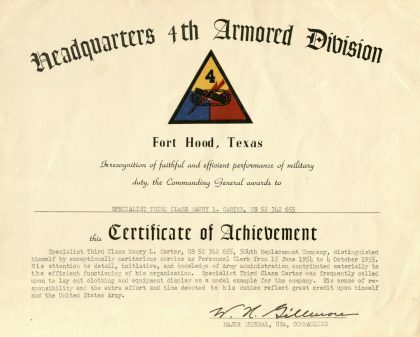 United States Army, 4th Armored Division Certificate of Achievement awarded to SP-3 Maury L. Carter. Well, at that time it was about the Cold War with Russia and they were developing – I worked for a while on the Titan program, ICBM… fortunately, a lot of the things that we worked on were never needed. But, if we didn’t have them it would have been bad. We never got to fire those things at an enemy which is good…. I walked in at 21 years old and all these guys around… Fellow by the name of Larry Devine was the first person I met in Baltimore: outstanding, smart, brilliant engineer. And, I think he recognized my dilemma, you know. So, he came to me and said, “Maury, if I can help you in any way let me know.” I said, “Okay.” So if I had a real complicated problem I couldn’t solve – of course, after a little while I was moving up the ladder, of course. Oh, there’s so many people: Larry Devine, Ed Schwartzman, Sid Stark. But I remember so many of the people that we moved down here with. We moved down here with Ed Uhl, was the VP and general manager. Then you had Jack Libby, you had, oh my goodness, Ed Schwartzman, Bill Sikes, Buzz Showalter…. Ed Wells was another good mentor….. I worked first at Martin Baltimore. Then they transferred me to Orlando. I came with the first group that moved here from Baltimore. 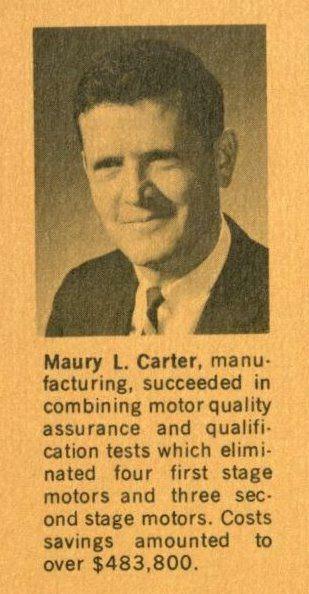 And that was in March of ’57 after the facilities were set up. The first group of workers was March of ’57 and I was in that group. 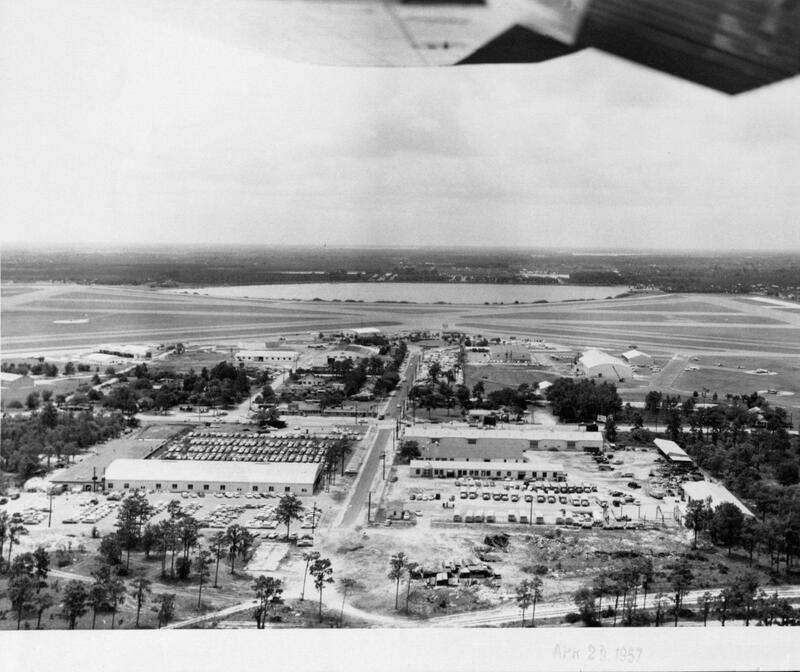 Aerial photo of the Martin Company temporary buildings on Elwell Street at Orlando Municipal Airport in 1957. 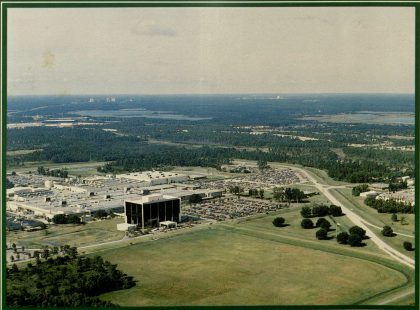 By January 1958, the Martin Company plant on Sand Lake Road employed 2,700 people. By 1961, Martin Marietta Corporation, Aerospace Orlando, employed 10,500 people with a payroll total of $71.5 million, the largest single employer in Florida. But then I worked here at Martin for a while and then that was from Baltimore to Orlando. Worked there for a while and then they transferred me to Denver for three years. Then from Denver they sent me to Little Rock, Arkansas. From Little Rock, Arkansas to Orlando from Orlando to Allegheny Ballistics Lab in Maryland, then back to Orlando. I usually ran the staff meetings. You know we had the Program’s Monitoring was up to me and my department. We’d run the meeting and each of those people would report not to me, I mean I wasn’t their bosses, but they’d report on the way to get the missile systems out the door. And our organization, planning department, was responsible for seeing all the pieces and parts are ready to go. Engineering would report, you got government shortage, that type of thing. I was not their boss, but I acted like it. And I had the backing of the head people in the company, too. 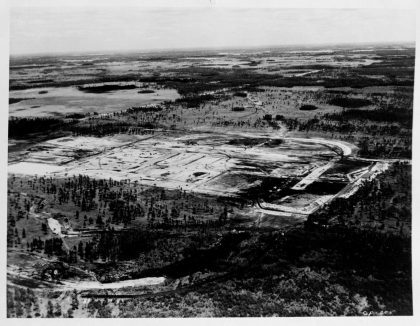 The Glenn L. Martin Company plant site located four and a half miles south of Orlando on Orange Blossom Trail, 1956-1957. 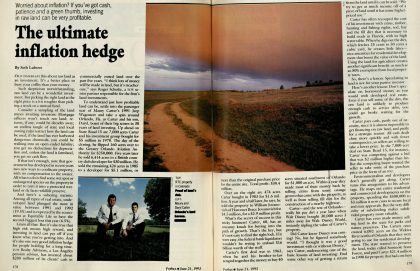 In 1956 the company purchased approximately 12 square miles of land for $1,950,000. They also donated 30 acres of land for three school sites. But anyway, Rolfe Davis was really a leader in the community. He was mayor at that time. Between George Bunker and Rolfe Davis, of course they had a lot of people helping them. Ed Uhl was the vice president and general manager when it opened here. Then Tom Willey later, but anyway that’s how it got here. They decided instead of Wichita to come here. But before they tried to come here they had to know where they were going when they got here. And they bought the land for a few hundred dollars per acre. You know, 4,000 acres. 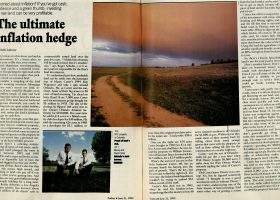 Some of it is now worth a million dollars per acre. George Bunker is the one who wanted to relocate somewhere… George Bunker got in touch with J. Rolfe Davis, the mayor. And Rolfe, what he did, when they decided to move here or there, he put together the land and all the team to get them here. So, he’s really the key person in getting them here. Were there many companies here at that time? No. It was called a cow town. Orlando was a tiny little area. Martin was the first thing that gave it a big boost. Dirt roads a lot of places. Dirt roads most of the way out there to the Martin plant. 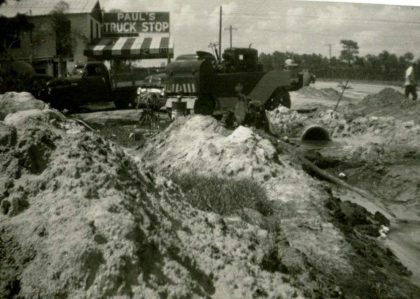 June 20, 1957 photo of the construction of Sand Lake Road, the new road for the Martin Plant. Martin Marietta Today, Number 3, 1982, cover photo, Martin Marietta Orlando Aerospace. The rectangular building in the clearing at the upper left, on the near side of the lake, is Orange County’s new convention center. The spherical structure in the distance to the right of center is part of EPCOT. 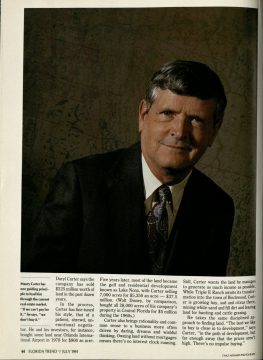 As someone who has witnessed the development of Martin coming to Orlando, what contribution do you think Lockheed Martin has made to the community? Oh, the biggest thing is the wonderful people. People around here, back then, Charlie Gray is a lawyer, have you heard of him? Good guy. He says back in those days when you got out of college if you didn’t have a family with 40 acres or more of orange groves, you had to leave and go somewhere else, you know. My son and daughter – my son’s right there. 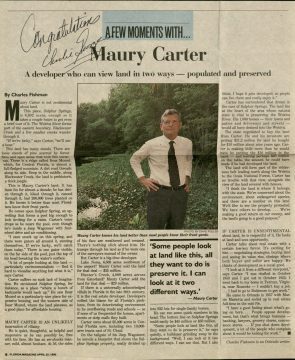 Maury L. Carter and his son, Daryl Carter, featured in Florida Trend, July 1991. You know when he got out of college he got a job right there. Well, in Virginia when I got… out of the Army, I couldn’t find a job in that area. So down here, my daughter went to University of Florida medical school. She’s a pediatrician, a doctor. Of course, there are a lot of babies now for her to take care of. So number one was the employment. But then other than that, see a lot of people nowadays they really frown on development. I like it. You know it’s exciting. 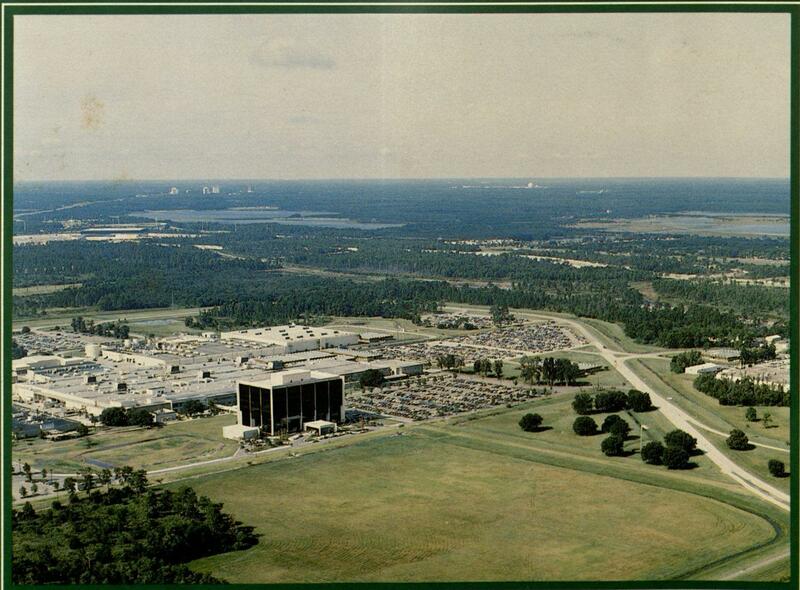 Before, back then, you had Chastain’s Restaurant and Ronnie’s… and Imperial House and Gary’s Duck Inn. But you didn’t have, now if you want to go – we have the arts center down there. You have golf courses for the people all over. And so you have so much to offer that would not be here if Martin – Martin got it really – I think you have to give Martin credit for getting it started. You know, stagnant area, unemployment. They got it rolling and got it started. So there wasn’t a lot of technological infrastructure at that time? Almost none. You had the little repair shops, TV shops and that type thing. Some of the other people may think of something, but it was mostly rural. 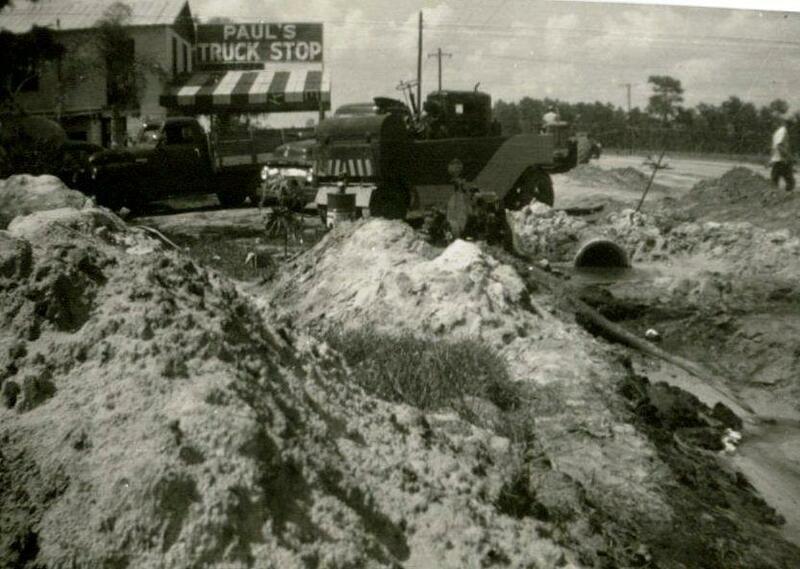 Downtown Orlando had, I think, less than a 100,000 people back then. And all the communities surrounding it were not there a lot of it. Well, you had Eatonville and Kissimmee, but they were in about the same shape as Orlando. Until the time I left there it was a great company for me to work for. It was number one…. I worked for a lot of people: vendors, contractors, people all over. Martin Company was number one. I left there – they didn’t lay me off. When I resigned and left there, you know, I said to them, I said, “Thank you for the job. If I ever come back to the industry this is where I’m coming if you’ll take me.” Of course, they offered me a job later… but they treated me so well, better than I deserved. I got raises and promotions…. I mentioned J. Rolfe Davis and while I was at Martin I got an offer by Rolfe Davis to go into, because I was part time real estate, and I got an offer by Rolfe Davis that was a lot more than I was making. I mean, I was making a good salary. I was in a management position which was a very good salary. But he made it even better and I thought it was time for a career change. So at age 39, Rolfe Davis made me an offer. And it’s interesting there I had a chance to work with Baltimore and what happened up there – got down here and I had a chance to work with the man that made it all happen. I couldn’t have a more exciting career. Got down here and got to work with the guy that made it happen on both ends. But, a while after I was, after that I left Rolfe Davis and he was retirement age, he retired. 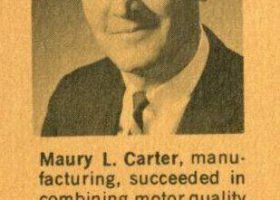 That’s when I started my own company… [Maury L. Carter & Associates, Inc.] He had commercial and residential that he was involved in. I’ve never worked residential. That’s more on the retail end. What we do is we work on – when I started with him on land and land development and big projects, you know. We do not do half acre lots… But yeah, it was all Central Florida. But we do projects other places, too. 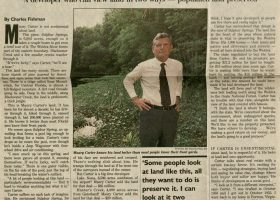 We’ve been involved in Georgia, Texas, Virginia. But this is our home base here and 95% of it is in Central Florida, big Central Florida. We go down to south Florida some and some in Jacksonville, Tallahassee. But most, the biggest part of it, there’s enough to do right here. “How to Survive the Downturn: Maury Carter of Orlando takes a dull approach to real estate. That’s exactly why he’s doing just fine.” July 1991, Florida Trend. Did you learn a lot from J. Rolfe Davis? Oh yeah. I guess you’d call him my boss, but I told him after he retired, he never asked me or told me to do anything. He was a consultant. He was a top level person, you know…. The thing about it, being the mayor, he was the chairman of the county commission at one time, and mayor of Orlando when Martin moved here. So he knew, if I was dealing with somebody on a real estate situation – Rolfe, what do you know about this? Oh, he’s so and so… So he was an excellent consultant. But if you asked him to prepare a contract or something like that no that’s not something he would have done. But early on no doubt he would. So it must have been a big switch from working at Martin to getting into real estate? What was it like starting your own company? Good and bad. You know when I started a company- before when I was with Rolfe Davis he had staff people. If I needed a supply, if I needed information, if I needed maps, if I needed whatever, I had somebody there with assistants who would do that. The biggest shock when I left Rolfe Davis and went into real estate on my own was the cost of insurance. You know at Martin I had an insurance plan there, you know, major medical and retirement. And then I left and I was sort of out on my own and I got to do that. Would you tell us about the company, projects you’ve worked on… in our area? It’s different because see in a real estate thing when a transaction occurs, if we were – we wouldn’t tell anybody right now. No, we trust you. But it’s a practice of Florida Statute Chapter 475 that says that if you reveal information, client’s information or what have you, if we’re working on a project here and we start talking about it and people aren’t supposed to know about it, my license could be in jeopardy. But once it closes I can tell you everything. I tell our people: Do not talk about this. But then I said, “When it’s closed you can tell the world if you want to no matter because it’s public record. I mean you can go down to the county, Orange, Seminole, Osceola wherever the deal was because it’s there, you know…. Over the years have their been certain projects that you were particularly pleased with having been involved in as far as your contribution to our community? I’m very lucky, there are dozens of them. Well, number one, I think, we handled the Lake Nona , the medical city there. We handled the Keene’s Point, Metrowest, the Lake Sumter College and hospital out there, twelve hundred and fifty seven acres that we developed there. And then we did Harmony, a 10,000 acre project down in Osceola County that was ours and then so many others. But we see those are deals we’ve done, public record. 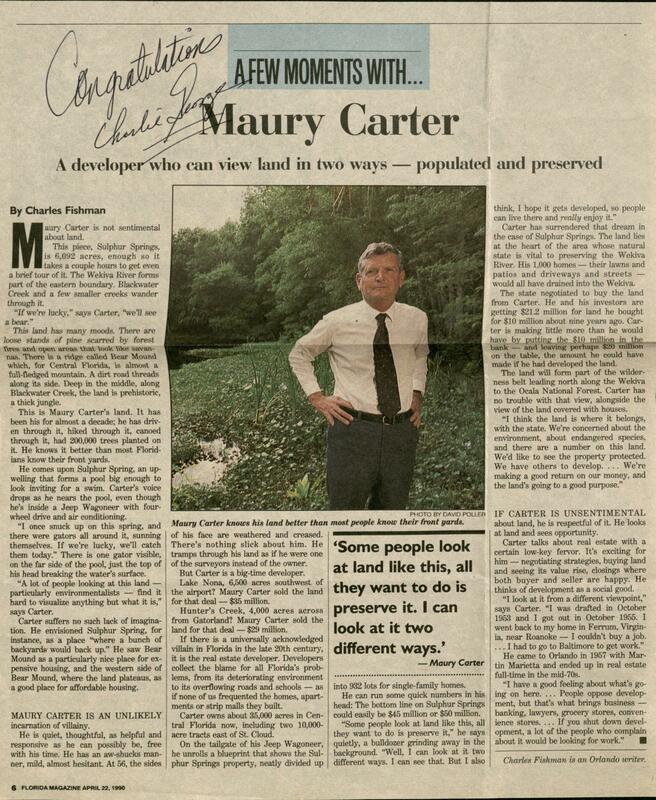 But, I think, fortunately with the help of a lot of people nobody in the area has done as much on land acquisitions, investment, and development as we have…. 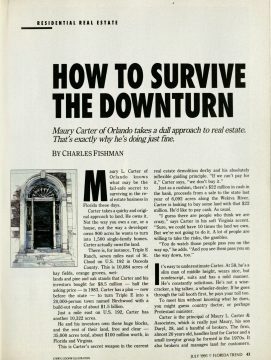 Florida Magazine, April 22, 1990. But there’s another thing, you know… we here are concerned about the environment. Here’s a good example, we’ve done about 75,000 acres of land preservation and here’s one of them. That’s one we did. It seems to me that you see our area as a place that’s prosperous for development and good for development? And if we have a project we do open spaces. But yeah, I may sound greedy, but we want to make money. So we like to do a little bit of both… I think as a result of our attitude about that we don’t have a lot of enemies. I mean, not many, but a few. When we’re doing a project there’s always one or two or three people that object. Like when Martin came down here people were all excited about the jobs and then they said, “Well, are you going to put explosives down there?” “Yeah. We got missiles and rockets in there and that goes with the territory.” “Well, are you going to blow up Orlando?” I say to my son,”If we can make 90 to 95% of the people happy we don’t care about the others.” Because really with that- if someone says, “You’re going to blow up Orlando?” that person doesn’t deserve an answer. One day I was asked if they had PhD.’s running the safety program out there. See there’s a lot of things about the engineering, design, the permit, the application. What are you going to do with it after you build it? Storage and that type thing, transportation…. What do you see as the future of our area? It’s just started. The real problem we have and I don’t want to sound bitter about it. I guess I am in a way. But the regulatory issues, you know…. Martin came here, J. Rolfe Davis and the team, they came here and they were welcomed. Build your plant here. You know what you have to do now to build a plant here? First you got to get your equivalent of a development of regional impact, your DRI. They call it something else now. You have to have all that. The land use is there. You got to do the environmental assessment, wetland assessment, archeological assessment, gopher turtle assessment and all those things, you know. Back then you didn’t have that. You went in and built your factory and moved on. In fact, I don’t know for sure or not, back then, I was told that, I followed it pretty close because Iwanted to be a part of it, and they said that it was Rolfe Davis and the team once it was a go – it was about 30 days – they had permission and approvals and everything to build it. Now you’re looking at years if you get it then. You couldn’t do it now. But, the big problem that we have in the growth of Florida, if they’d get out of the way, they get mad at me for saying that. But, if they’d get out of the way, then it will continue. People talk about it being overgrown. You fly, sometimes you get up in the airplane, look out. Once you leave here, millions of acres- any direction- and we’re fortunate too, you get over a development project, you get over the ocean area that way – of course, you got to go this way. Here, we can go all over the place if you want. And there’s good land to do it with, demand, and jobs for people. But, I think, the environmental people, the regulatory people, the land use people, if they’d really stop with their restrictions and all that stuff. I mean, you got a project, you got to go through a DRC – Development Review Committee. You’ll have a room full of people looking at anything you want to do. Now you try to get a plant open in a short while. [You’re talking about state regulations?] Yeah, keep going. Yes, state, county, local, planning, you know, planning department, county, city, everybody and all the way up to Tallahassee…. 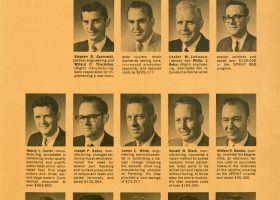 Are you surprised that Lockheed Martin is where it is today… from the time when you started with the company? Your company has been very successful hasn’t it? 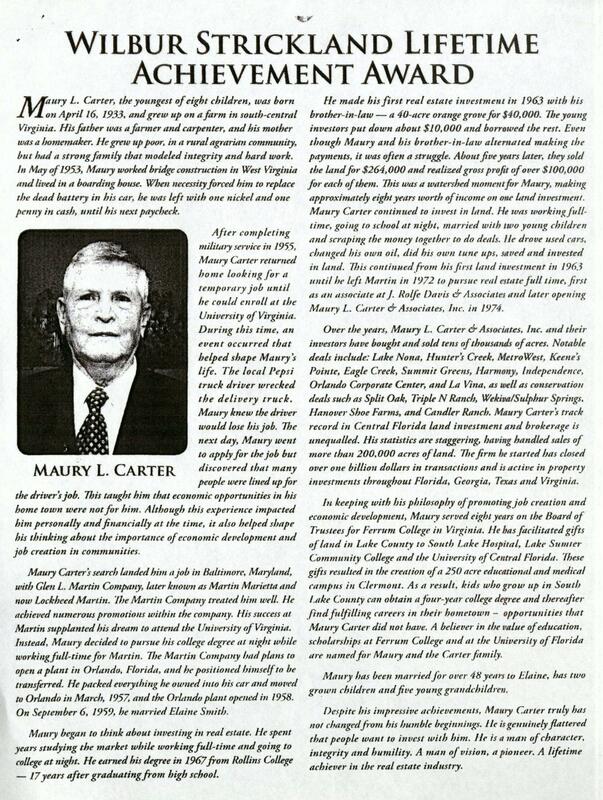 Maury Carter and Associates. Well, we think it has. I thank you for saying that… But you know we’ve had good people like Rolfe Davis to get going in this thing. Good people in the community and investors and the number one thing is the location, you know. If I tried to do this in Ferrum, Virginia, you know, I wouldn’t do very much. No, it’s we’ve had an awful lot of help. Good people…. The most interesting thing for me is that, you know, before the beginning of Martin Orlando, I was there and saw the whole thing and met the people involved then on that end. When I came to Florida I had the opportunity then to get into real estate and work with the key players Rolfe Davis and the team there to put the thing together down here. So, I’m fortunate I had that. So, anyway that’s it. 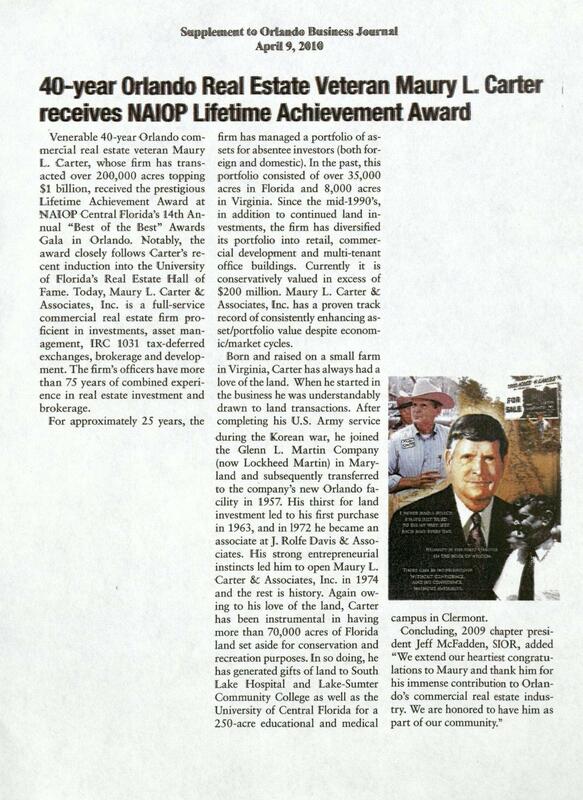 40-year Orlando Real Estate Veteran Maury L. Carter receives NAIOP Lifetime Achievement Award, Orlando Business Journal, April 9, 2010. Now don’t get me wrong. We want to make money because I have to send kids to college. I have grandchildren and expenses. So we want to make money. So it’s both. But I think we can do both. Can’t go in and develop every inch of it. We like conservation. We also really like the real estate investments and development. Place: Maury Carter & Associates, 3333 S. Orange Ave # 200, Orlando, FL 32806. 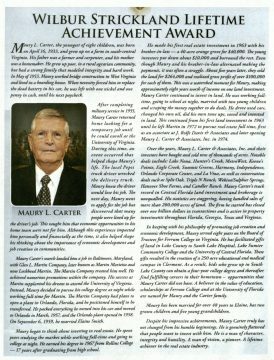 Oral history interview with Maury L. Carter, October 26, 2016.